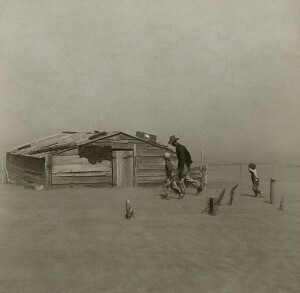 As hardy, resilient Oklahoma farm and ranch folks, my grandparents faced drought, floods, the effects of two world wars, the Great Depression, and the Oklahoma Dust Bowl. As for the last disaster, my mom remembers wetting towels to put in the windows and around doors in an attempt to keep the dust from coming in the house. Preparedness helped make life easier. In another childhood moment, she sat terrified in the storm cellar as her dad and granddad held the door shut with strong rope to stop the suction of a tornado from pulling anyone out. This is not to say every day of farming and ranching was horrible. But all my family grew up keenly aware of how to “hope for the best, but be prepared for the worst.” Taking the personal responsibility to prepare is simply a family habit. For my grandparents, that meant taking time to put things out of the way of floods before the huge thunderstorms rumbled by. It also meant stocking up on supplies — enough for both humans and livestock — in case no one could make it to the store for days or months. Their due diligence in keeping the farm safe and secure even included the best and most feared Doberman Pinscher in the state, Duke. Preparation is key in self defense and emergency thinking as well. As a volunteer firefighter and EMT a few years back, I was trained in HAZMAT drills that were pretty unthinkable and unlikely. I sure hope a dirty bomb doesn’t go off in my city, but thankfully our local firefighters could handle it and much worse. My karate students over the years worked their butts off to make themselves ready for something that may never happen. So did I. I really doubt I will need the skills learned in those blindfolded drills against multiple attackers, but still it was fun, exciting, and taught me to move and think in different ways. Preparation is key in facing disaster, the bully at school, or the knife-wielding attacker. Research shows people with even a small sense of control over their situation perform better that those who believe they have no control. When you realize you have options, you are enabled to take more effective action. Some people can fly by the seat of their pants through tough times, emergencies, disasters, or difficult relationship, but it is rare! The rest of us have to rely on preparedness. Thank you. Couldn’t agree more. Preparedness from a place of positive thinking and pure old fashioned common sense stops you from being a Cassandra or a misery. Feeling you have the spiritual – and practical skills – to help you cope with anything life deals out is one of the best ways to feel in control of your life, if such a thing is possible. That’s why I love the Serenity prayer so much. Previous post: Are you ready to free yourself from narcissists?